June 29th, 2017 By: GGT Category: 2018/01 release, Figure News. Phat! company is going to release the Suzunoki Rin ( 鈴乃木凜 ) Swimsuit Ver. ( 水着Ver.) 1/10 PVC figure from the manga/anime “Bakuon! !” ( ばくおん!! ). Will be released in January 2018. Around 150mm tall, 5,800 yen. "I love my bike way more than you like yours!!" From the popular series that mixes high school girls and motorbikes, ‘Bakuon! !’, comes a figure of the girl who loves her Suzuki motorbike above all else, Rin Suzunoki! 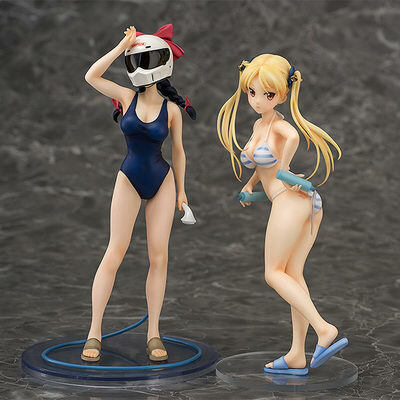 The figure is based on the scene from the fifth episode of the anime series, where Rin puts cleaning detergent on her own body to use it to wash her motorbike. Be sure to display her with the previously released Raimu Kawasaki: Swimsuit Ver. !